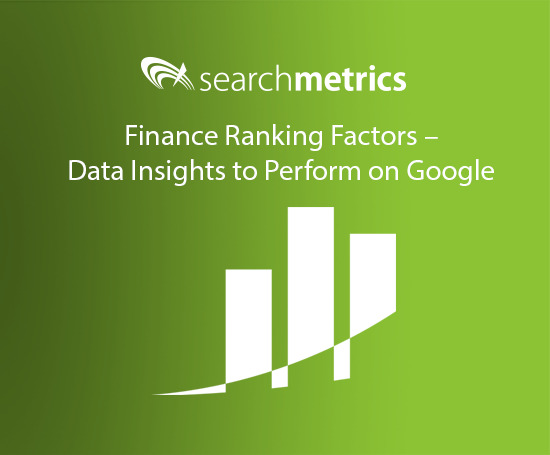 The latest Searchmetrics ranking factors study shows how relevant content is vital for finance industry websites looking to perform on Google search. Finance is the subject of a Searchmetrics series of ranking factor studies that focus on a specific industry. Amongst the findings, the analysis shows that relevant, structured content is even more vital for high rankings when competing for finance-related keywords than it is in other sectors. Using an example from the industry, we explain how understanding these ranking factors can be put to practical use to boost your website’s performance. Searchmetrics has been publishing ranking factor whitepapers for specific industries since the start of 2017. These provide more detailed conclusions for SEOs, online marketers and decision-makers for companies, publishers and consultants in a particular sector, showing them where they should focus in order to improve their search performance. This finance study is one of our industry-specific ranking factors whitepapers. This is the web version of our infographic. You’ll find a high-res (printable) version on our download page. So why is relevant content so important in the finance industry? Well, prospective customers are not just looking for any old mortgage, credit card or insurance policy – they need information about conditions, security and special offers. 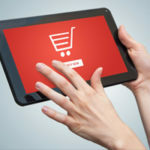 And existing customers are most likely to become aware of new financial products and services when they use the website not just as a place to check their bank balance or get the latest exchange rate, but as an interesting and helpful source of information. Bankrate.com recognized the importance of relevant content – which has now been confirmed by our finance ranking factors whitepaper – a long time ago. If we look back over the historical trend in SEO Visibility of the domain bankrate.com, then we see a steady and significant period of organic growth, in particular between the end of 2012 and mid-2016. At the start of 2013, Bankrate.com’s SEO Visibility stood at 236,141 points, rising over the next three and a half years to peak at 350,950 in mid-2016 – this is a 50% increase from what was already a fairly strong starting position, putting it at the front of the pack for many high-competition keywords (with large search volume). In the last year, this SEO Visibility has been maintained. 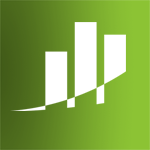 How did Bankrate achieve this success? Firstly, we can use archive.org to take a historical look at the domain’s homepage. This already gives us insight into the way Bankrate has developed its content over the past years. 2012: The homepage provides a wide variety of elements, including news, trends and data feeds, menus, previews and images of several different kinds of content. This makes it clear that Bankrate offers information on many different topics, but the large range of items is not supported by an adequate navigation to guide the user to the desired content. 2016: Four years later, the homepage is still acting as a window to lots of other content, but it has been tidied up, and structured more clearly, with an improved use of lists and fewer elements overall. The menu ribbon at the top of the page has also been reduced in length and made clearer for users. In addition a “Welcome to Bankrate” at the top of the page aims to help site visitors navigate easily to the content they are looking for. 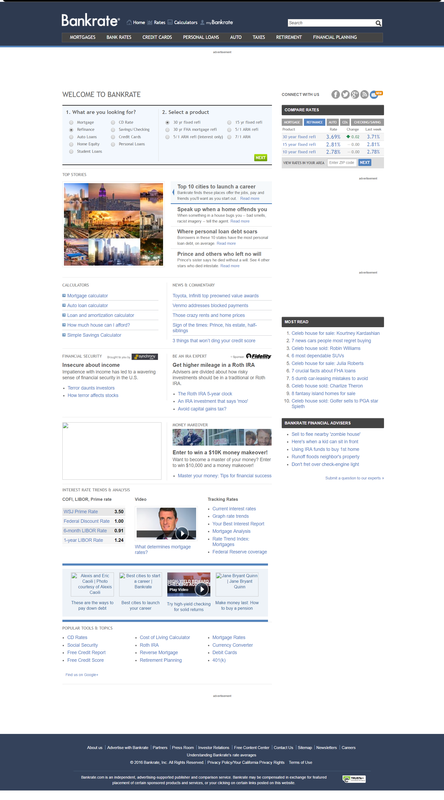 Today: The domain’s homepage has now become much less text-heavy and much more focused on navigation. Rather than attempt to include snippets of all the content the website has to offer, the homepage now focuses on its core services. The section above the fold provides instant access to six different loan calculators. Below this is the data feed of national mortgage rates, much more prominent than before. 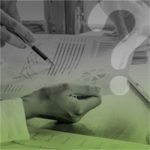 Beneath the graphs are six clearly structured content sections, each with an attractive image and a list of three main articles providing answers to questions users may have. This streamlining of the homepage highlights core services without further digging, and creates a much better navigational experience for those looking for more detailed content. Who is ranking for “mortgage rates”, and why? If we now look a bit deeper, we can analyze the relevance of content on bankrate.com’s individual landing pages. As an example, we can look at a page which ranks on Google’s top position for the term “mortgage rates”, which has a search volume of 252,893 queries per month. 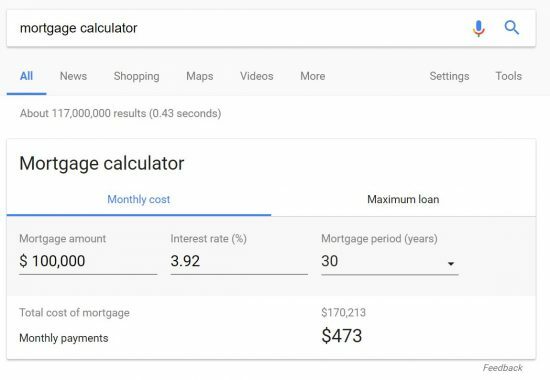 As an aside, Google now offers its own information containers at “position zero” for several finance-related searches, such as “mortgage calculator”. This means that the organic search space finance sites are competing for continues to be squeezed. 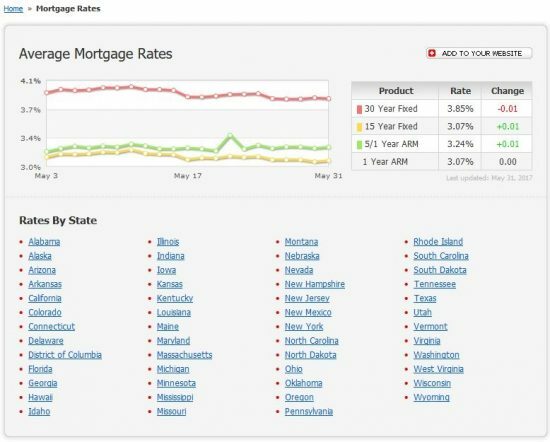 Now let’s look at “mortgage rates.” Besides bankrate’s top-ranked URL, other sites ranking on the first search results page include nerdwallet.com (position 5) and mlcalc.com (position 9). The question is: What is it about Bankrate’s page that makes it better and puts it at the top of Google’s rankings, ahead of nerdwallet, mlcalc and the rest of the competition? To look for the answer, we used the Searchmetrics Content Experience to analyze the Content Score of three landing pages, which provides detailed insight into the relevance of a page’s content, and enables a direct comparison with competitor URLs. The table shows that Bankrate has a much higher word count, with more than double the amount of nerdwallet.com. 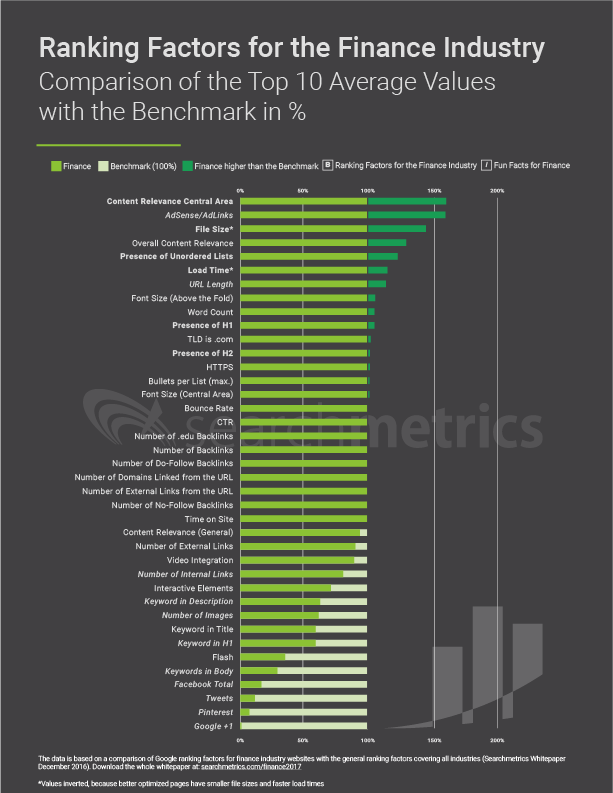 The content score of 91% is also notably higher, indicating that bankrate.com’s landing page offers the most relevant content of all three URLs analyzed. Interestingly, mlcalc.com is the star performer in terms of load time and file size (4.9s and 490KB). However, it still ranks worst of the three pages, as its Content Score and word count barely register (7% and 128 words). If we look at mlcalc.com’s page, it is easy to see why. 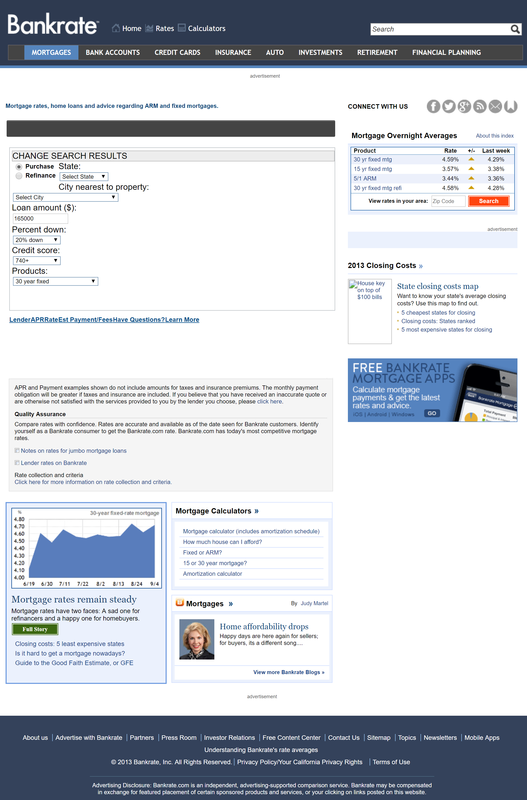 The landing page consists, in its entirety, of a graph showing mortgage rate trends and a state-by-state navigation menu. This can be very useful information, but it can only satisfy a highly-specific user intent, and as such does not represent the kind of holistic content that is likely to rank well for many different keywords related to the topic of mortgage rates. These observations tally with the ranking factors measured for the finance industry, which show that content relevance is the most important factor when optimizing for high rankings in organic search. The relevance of content in the central page area amongst pages in the top 10 of Google.com’s search results stands at 145.5 points on our content relevance index. By comparison, the benchmark average, calculated based on a general keyword set covering all industries, is just 90 points. It is perhaps unsurprising that Google expects such a high level of content relevance for finance websites. According to some psychology studies, videos can be a good way of capturing users’ attention. However, when people are looking to make complex decisions, like taking out a loan or an insurance policy, then more detailed, holistic, relevant text content works better. The importance of load time and file size, however, could be what help mlcalc’s URL to even get onto Google’s first page, and what contribute to nerdwallet.com’s (relatively) poor ranking at position 5. In spite of strong content, the load time of 27s makes it over three times slower than bankrate.com’s top-ranked page. Continually updating and adapting content to meet the user intent can help a website to maintain a presence at or near the top of the organic search results, because users are more likely to be satisfied with content that answers their questions and is relevant to their needs. Over the years, bankrate.com has revamped its URL on mortgage rates and expanded the content on the page. In 2013, besides links through to other sections of the domain, the URL offered little more than a mortgage rate calculator, a data feed, and two informative paragraphs. Now, the page provides an extensive list of up-to-the-minute mortgage rates from different providers, the data feed, and is supported by detailed information on the topic. An analysis of the Content Score rates the 2013 version at just 60%, way short of today’s 91%. 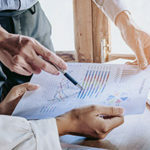 Online success can be predictable – provided the right data is analyzed and used to drive decision-making and optimization measures. For finance websites, the creation of relevant, well-structured content is the most important factor for organic search performance. Bankrate.com’s website shows that focusing on content which is of genuine value to the user is a strategy that can lead to long-term success. All relevant ranking factors, examples and analyses for the finance industry, including the full version of the infographic, can now be downloaded in our free whitepaper. This is one of the few write-ups on the topic of finance site ranking factors that I’ve seen. 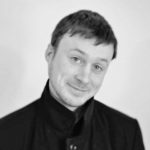 I certainly agree that “for finance websites, the creation of relevant, well-structured content is the most important factor for organic search performance” – SO very true!